Winning the Healthy Happy Dog Trifecta #GetHealthyHappy #StayHealthyhappy. It wasn’t too many years ago that dogs were considered a backyard pet. Pet owners were limited in choices of food, toys, treats, and available information. Vet visits were limited for most pets and if you’d asked your average pet owner in the 1960’s if they brushed their pet’s teeth, you would have been met with a puzzled look. Thankfully, the times have changed and our pets are the benefactors. We now know what it takes to win the dog owner’s trifecta for healthy pets. The first leg of this trifecta is a great partnership with your veterinarian. Consider your vet a family doctor. Missing one year’s annual vet checkup is the equivalent to missing five years of human checkups. 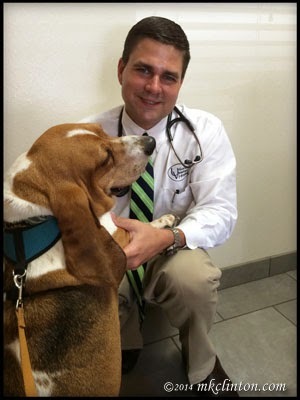 A great veterinarian will understand your pet’s nutritional needs, monitor their weight, suggest the proper food, and perform an entire body examination. If they discover anything that is out of the ordinary, an early diagnosis and treatment could make all the difference. You can watch Dr. Ashley Gallagher of PetMD discuss three ways to keep your pet healthy and happy here. Our second leg in getting healthy and staying healthy is proper nutrition. Instead of a couple of brands to select from, we now have aisles of dog nutrition options. It can be a bit overwhelming to the pet parent. Fortunately, it doesn’t have to be thanks to Hill’s Pet. Hill’s offers a wide variety of healthy dog food to address any problem areas for your pet. Whether they need to lose a few pounds, eat grain free, prefer wet or dry food, or a finicky eater, Hill’s has a formula to suit them perfectly. It is tempting to share a bite of what you are eating, but many things we eat can be dangerous to dogs. Read a list of potential dangers here. A little trick that we have embraced is carrying a couple dog treats to the table and when it comes to begging, they get a nutritious bite of a healthy dog snack. It is important to consider those daily treats into your dog’s daily calorie count. Walking is a great exercise for fun and fitness. Our final leg to winning the healthy happy trifecta is all of the little extras like playing, grooming, and exercising your dog. Dogs enjoy playing with their humans. Toys also add so much to your pet’s life and keep them mentally stimulated. Imagine what it is like to be your dog, and you will understand that life can get boring. 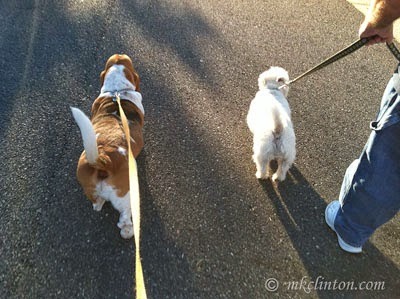 If all your pet does is go outside for a potty break, think of the fun they are missing. If you have a yard to play in, go outside for a romp. Be sure to go on daily walks. Walking has been proven extremely beneficial to dogs and humans. It is a great way to let your dog sniff new scents, learn its way around the neighborhood, and meet new people. You don’t have to run a marathon or trek for miles, just get out and enjoy each other. grooming. The term “dog breath” does not have to be a negative thing. Proper brushing with a dog friendly toothbrush and toothpaste can make a huge difference in your dog’s health. A good dental regiment can add two or more years to your pet’s life. Hill's offers an Adult Oral Care food. Proper bathing and brushing are important parts of a successful grooming program. Dogs need baths, but with daily brushings, you can eliminate the need for weekly baths. Excessive bathing can lead to dandruff and dry itchy skin. Make certain that you are using a dog shampoo tailored for your pet. A little research can help you choose the formula that is right for your best friend. If you incorporate a great veterinarian, wonderful pet food, and treats, along with fun physical activities, you will hold the winning ticket to a healthy happy dog trifecta! Join Barking from the Bayou and Hill’s Pets to #GetHealthyHappy #StayHealthyhappy. This post is sponsored by Hill’s. I am being compensated for helping spread the word about Hill’s® Science Diet® Healthier Pets. Happier Lives.™, but MKClinton Barking from the Bayou only shares information we feel is relevant to our readers. Hill’s Pet Nutrition, Inc. is not responsible for the content of this article. How times have changed and still some countries still consider dogs as backyard pets. We are so spoilt for choice on many fronts these days as a pet owner. Have a wonderful Wednesday. Great post, always love seeing that teeth brushing photo of Bentley. Mom is always amazed at how things have changed for pets since she was a little girl. Thank goodness I wasn't just a common old dog back then! Nice post. Such a wonderful and helpful post, thank you for sharing! Really helpful for us. We didn't have dogs growing up. My first dog didn't come until I was married, and things have even changed from then (just over 20 years ago) until now, especially for our dogs! The current dogs get a lot more than our first dog did and we are far more aware and educated about taking care of dogs now. 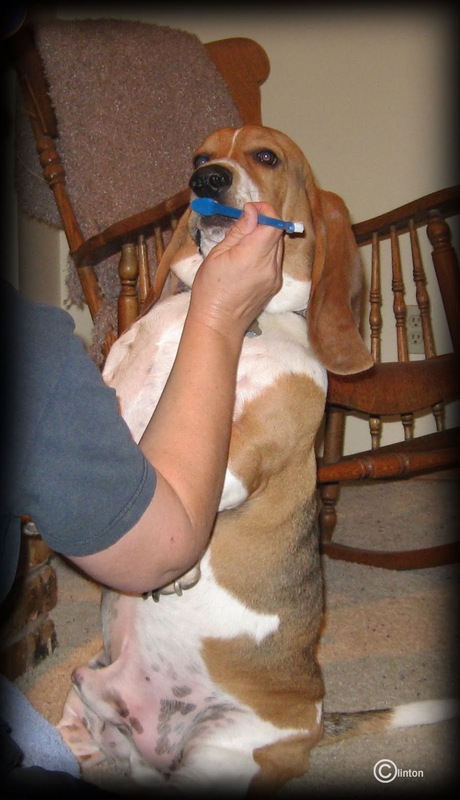 Great picture of Bentley getting his teeth brushed. Bentley, sure is a good boy while getting the pearlies brushed.....Our peeps learned WAY Back about us doggies and taking care of us, they really enjo their time with us and playing! It is amazing how things have improved over just the past 5 years!!! Great post! It's good to see people realizing the importance of good health for our canine companions! I'm glad that people pay more attention to what pet food they buy lately. And Hill's is definitely one of the better brands.